FIGURE 1-42 Zinc finger motifs present in hormone response elements of steroid receptors. (A) Generic representation of a Zn+ finger. A highly schematic model for the general conformation of the DNA-binding domain is shown with each amino acid represented by a sphere; the polypeptide chain in each finger is actually thought to be folded into a complex globular conformation. conversion of the nucleotide sequence from GGC to GAC results in the mutation at position 30 of a glycine to an aspartic acid residue, which results in an inactive receptor. If an individual is homozygous for this mutation, then he / she will suffer from vitamin D-resistant rickets, type II (see Chapter 9). FIGURE 1-43 Three-dimensional structure of the DNA-binding domain (DBD) of two estrogen receptors interacting in the major groove of DNA. The zinc ions of the zinc fingers of the DBD are shown by spheres. The recognition helix lies in successive major grooves of the DNA. Modified with permission from Luisi, Jr., B. F., Schwabe, W. R., and Freedman, L. P. (1994). The steroid/ nuclear receptors: From three-dimensional structure to complex function. Vitam. Horm. 49, 1-47.
of the gene being modulated. 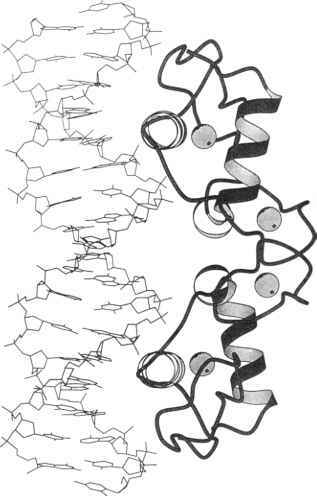 A dimer of the activated receptor with its four zinc fingers in the a-helix interacts with the major groove, i.e., the DNA that contains the promoter of the gene being modulated. The X-ray structure of the ligand binding domain of both the human retinoic acid RARa receptor and the human thyroid receptor have been determined; the structural features were remarkably similar, perhaps reflecting that both receptors belong to the same steroid receptor subfamily (see Table 1-10). Both structures revealed that the ligand is buried in a hydrophobic core. The carboxy-terminal activation domain F (see Figure 1-26) of the thyroid receptor was found to form an amphipathic a-helix, with its hydrophobic face constituting part of the hormone binding cavity (see front cover of this book). One important approach to studying both the detailed structure and function of steroid receptors and the specificity of their interactions with acceptor DNA, as well as the specificity of their ligand-binding domains, has been to use the techniques of molecular cloning. Thus, it has been possible to construct chimeric receptors where, for example, a progesterone ligand-binding domain is substituted for the estrogen-binding domain of the estrogen receptor; in this instance, progesterone will activate the estrogen receptor. The specificity of the acceptor DNA sequence and the exact location of the HRE on the promoter in relation to the TATA box or start signal can also be determined. An example of this molecular biological approach to understanding steroid hormone action is presented in Figure 1-44. The critical but complex details of how the physical presence of the occupied receptor interacting with the HRE of the appropriate gene and other transcription factors results in specific activation or repression of the gene in question remain to be elucidated. As suggested earlier, it appears that it is a homodimeric form rather than a monomeric form of the receptor that interacts with the hormone response elements. Thus, each of the receptor subunits likely interacts with one-half of the consensus nucleotide sequence of the HRE elements listed in Table 1-10.